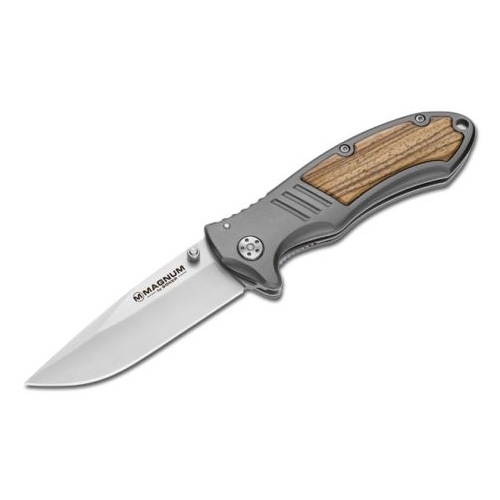 Boker Magnum Co-Worker Folding Knife. You cannot imagine a more reliable companion than the Magnum Co-Worker. It is a sturdy and high-performing knife, ensured not least by the 440 stainless steel blade, the linerlock and the deep finger groove. The grey anodized aluminium handle and the light Mediterranean wooden scales create a precious overall picture. Includes lanyard hole and convenient pocket clip. Pure quality fits nice and very sharp, easy to hone, solid formed. Robust well made and a good edge make this kinfe a bargain.